Mix together flours, salt, and yeast. Using microwave or stovetop, heat milk until warm (i.e. 120-130 degrees F). Using electric mixer, combine flour mixture with warm milk. Add in honey and softened butter. Place dough onto a well-floured surface. Knead well for about 5 minutes, dusting with flour as needed. Grease a medium bowl with cooking spray. Let dough ball rest in greased bowl for 10 minutes. After dough has rested, place dough ball onto a well-floured surface again. With a flour-dusted rolling pin, roll dough out into a rectangle approximately 12 inches x 10 inches. With a sharp knife, cut dough evenly into 6 pieces. Roll each piece into a thin, 6-7 inch square. Place frozen Boca ground crumbles into a large microwaveable dish. Microwave on high for about 2 minutes and then mix with ground pepper, to taste. Place one slice of cheese in the middle of each dough square. Then scoop up 1/2 cup ground crumbles and place onto cheese. Try to keep the crumbles on top of the cheese and not the dough. Bring together the sides of the dough and wrap around cheese/crumbles. Wet your fingers and pinch together the seam. Make sure its sealed tightly. Place filled bun, seam-side down, onto greased baking sheet and repeat with the other 5 dough squares. Let them rise about one hour in a warm place (they won’t rise much). Once the hour has passed, in a small separate bowl, beat egg. Brush generously onto each filled bun. 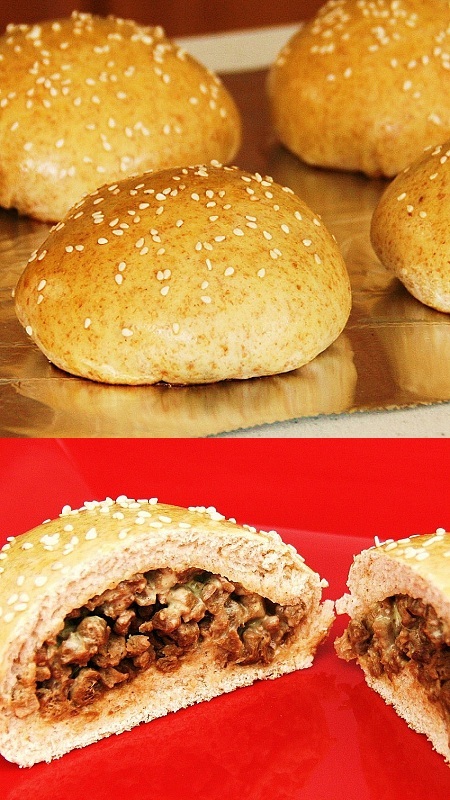 Sprinkle with sesame seeds if desired. Once finished baking, remove buns from baking sheet and place onto a cooler surface. Eat and enjoy! They’re best when they’re fresh.